Feeling a little rebellious? Like a pale ale that has gone astray? 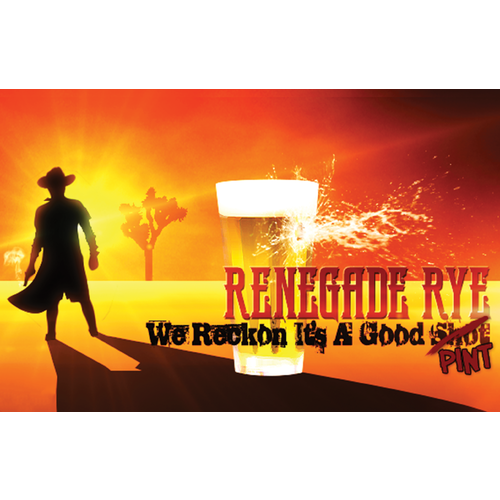 While the Renegade Rye doesn't break all the rules, it certainly deserts the path of an average pale ale! The backbone of this brew contains over 15% rye malt, which adds slight fruity and spicy characteristics to the malt flavors. The clean bitterness from Magnum hops allows these malt flavors to mix perfectly with the aromas of Columbus, Citra, and Centennial hops. 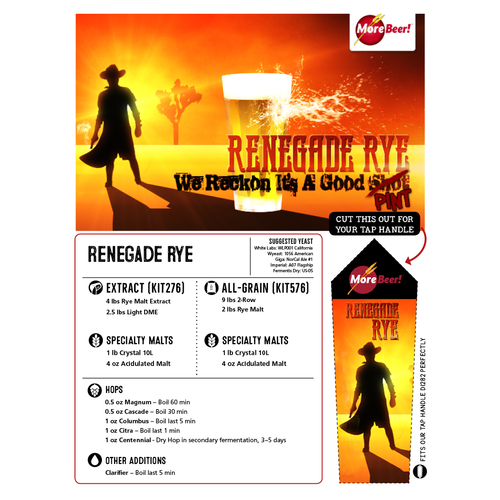 So go ahead, brew the Renegade Rye, and rebel against standard pale ales! Reminds me of last summer. Took this beer camping with the family. The 5 gallon keg was kick in no time. I've wanted to brew a Rye beer and this one sounds like a good option. 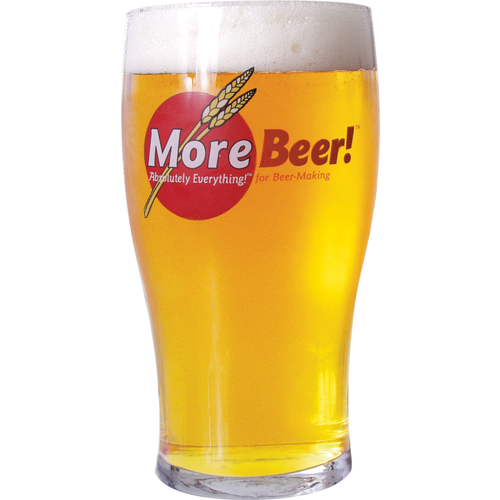 Very good.ive brewed 40 gallons of it and it's just a good beer and price is right too!! I have brewed this so many times. Alway a sad day when the keg goes dry. I love Rye PA (And Rye IPA's), and was so surprised by this one, that I'm going to be making it again, and again. I have had lots of great feedback from friends and family who have tried it. There is one problem, is that is so good, it goes so fast. I bought this the first time because of the low price. I've bought it since because it's a great summer beer. With the addition of a little coriander and some German Mandarina Bavaria hops for added flavor, it's become my go to beer on a hot summer day of yard work. I've made this a couple of times and really enjoyed it both times. Great balance of hop flavor without being "too hoppy". I've made it with and without the dry-hops and liked it both ways. One of the better deals in all-grain recipe kits I have found. Being a fan of all things hoppy and not necessarily like the other 50+ kits out that are about all the same, I gave this a try. The low price almost put me off. Did a BIAB all-grain batch of this and fermented with 1217 Wyeast, and WOW is this an awesome combo. I'd think it would just as good with US-05, 1056 or any other California style ale yeast as well. The rye comes through clearly, but not overpowering at all. Overall, a very nice change from the normal Pale Ales that will be a multiple brew beer for me. I figured I had to give this one a try given the price, and I was incredibly impressed. I ordered another kit within a week of cracking the first batch! It's a great blend of hops that combine well with the slight dry/spiciness of the rye malt. This beer has enough character for the craft beer fan, but is light enough that you may be able to convert others who prefer massed produced golden suds. I used a strainer after the boil before adding to the primary fermenter, and racked to a carboy to dry hop after a week. I used a sanitized nylon grain bag on the end of my siphon hose to help catch the dry hops and ended up with great clarity and low sediment in bottles. I put half of the second batch in my 2.5 gallon keg. This one should be great for gatherings! I bought this largely as a filler to get free shipping with very little in the way of expectations. I BIAB mashed this and fermented with Wyeast 1217 (West Coast IPA). I don't know if it is the yeast or the beer itself, or the combination, but WOW this is a good beer--even early on. I have only had four bottles from the 5.5 gal batch, but this kit is now on my "must brew regularly" list. A little spicy, but nicely complements the hops, with a within-style slight maltiness at the end. The head on this beer is unlike anything else I have brewed before--creamy and thick even with lower carbonation levels (the Rye malt?). Appearance is also great, as it looks like a perfect Pale Ale and tastes not too far away from a session IPA. Highly recommended! I am transferring to my secondary today and I couldnt be happier with my results so far. I was worried about the batch once it first entered the fermenter, my beer was very murky and dirty looking and it didnt resemble anything I have made before. There was a thin line of what looked like what my finished prodeuct should be but immediately below that was a redish, grey mess. As time went on I could see a progession of my yeast from the top all the way down to the bottom, inch by inch, of the carboy and instead of this messy looking material I now had a glowing Rye! I am planning on fermenting again today to further clean this brew up and I will be dry hopping as well. I cant wait to drink it up, Cheers! Was a bit worried about this one due to the cheap price. Turned out execellent! Just tapped the keg and the flavor is great. Nice hop nose from the dry hops. A bit of spice from the rye, adds another dimension. Nice dry finish. Used US-05 yeast and ended with 1.010 FG. Might be the new house beer.